I like this theme, although I wasn’t crazy about all of the entries (more on that later). I was surprised when I looked at the time; I thought it was over five minutes. Goes to show you….something. The theme makes use of one of the English language’s peculiarities: words or phrases which can have two meanings that are opposites. 1a [Support … or impede] is HOLD UP. 23a [Go to battle alongside … or struggle against] is FIGHT WITH. 40a [Offer for consideration … or remove from consideration] is TOSS OUT. 42a [Withstand … or deteriorate] is WEATHER. 53a [Watchful care … or careless mistake] is OVERSIGHT. 71a [Give approval to … or express disapproval of] is SANCTION, which was the first thing that popped into my head once I sussed the theme at 1a. 72a [Quit … or agree to keep going] is RESIGN. This is the one I really don’t like. I know that one can be resigned to something, but I have never heard it used in this form. FIGHT WITH and TOSS OUT aren’t wonderful, since each has one meaning that is much more frequently used, and CONTINUE is a bit obscure. It’s a lot of theme material, and I really liked the others, so it’s better than break-even for me. I also like the symmetry; for some reason, I find it very pleasing. 17a [“No hard feelings, man, right?”] is WE COOL. 16a [Like nosebleed-section seats, usually] is REARMOST. Which they are, but they are distinguished mostly by their height. Nosebleed seats could be directly above seats that are on the lower levels, so they are just as far back but not in nosebleed territory. 36d [“Well, sor-r-ry!”] is SUE ME, which I usually see with “so” in front. 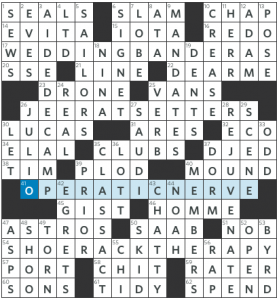 I filled in 66a [Request to be excused] from crossings and couldn’t figure out what it was before I looked at the clue. MAYIGO is not a word….because it’s three words. 58d [Card catalog ID] is ISBN. Books still have ISBNs but they are no longer listed in the card catalogs. Sigh. I loved card catalogs. 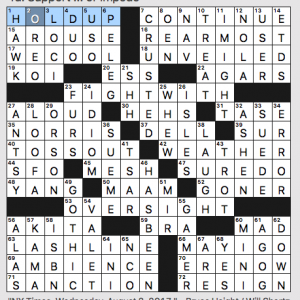 What I didn’t know before I did this puzzle: honestly, I got nothing. Knew it would happen eventually. It’s not really the “end of an era” in this grid, rather the “addition of an ERA.” ERA has been added to certain phrases. I’m not sure how this results in a title of “Take Some Time,” but there ya go. 17a [Melanie Griffith decision of 1996?] WEDDING BANDERAS. Wedding bands. This feels like a really awkward answer. “Wedding” is synonymous with “marrying” here, but it still doesn’t feel quite right. 26a [Say “You mutts couldn’t catch a dead grouse,” say?]] JEER AT SETTERS. Jet-setters. Meh. This feels forced. 41a [Diva’s trademark brazenness?] OPERATIC NERVE. Optic nerve. I like this one. It flows naturally and the clue makes sense. 54a [Staring at one’s vast pumps collection to ease depression?] SHOE RACK THERAPY. Shock therapy. This would be fine if there weren’t already a distracting ERA in the base phrase. So I had a hit-or-miss experience with the theme entries. Mostly miss, if I’m being honest. The rest of the grid is quite nice, though. I love AIDE-DE-CAMP, SAILORS, and CLASS ACT. REJUVENATE is also nice with its Scrabbly letters. Also good: SIGNET, MANDATES, CHATTY, JULIO, and “DEAR ME!” Little to nothing to complain about, either. 39d [Antecedent]. PRIOR. I did not realize “antecedent” could also be an adjective. I thought it was just a noun. 10d [Folder’s creation]. CREASE. I thought this was going to be CRANES at first. 44d [He put two and two together]. NOAH. 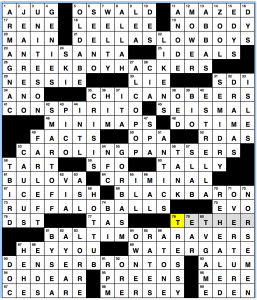 Immediately after the “Aha!” moment, I thought this was a clever and cute clue. But then I realized that NOAH really put one and one together, not two and two—unless he was doing some four-way swinging match-making the Bible didn’t tell us about. Overall in this grid, the really nice fill rescues the theme which felt just a tad off. Puzzle seems to feature second parts that are tops. I am acutely ill, so will let you discuss it further if you so wish. Other things I liked in the puzzle: Krampus the ANTISANTA, CONSPIRITO, BLACK BARON, WATERGATE (OH DEAR! ), ARMANGNAC, ESTRELLA, and NORSEMEN. I’m missing something, but still thought this was a good grid. This entry was posted in Daily Puzzles and tagged Bruce Haight, Byron Walden, Daniel Hamm, Debbie Ellerin, Mike Shenk. Bookmark the permalink. NYT – I assumed the second meaning of resign was “re-sign”, which would be pronounced differently, so that doesn’t really work either. If you’re resigned to your fate, you resign yourself to your fate. Jenni notes the past tense is more common for this sense, but the infinitive is standard too. NYT: I loved it. It really struck a chord. I don’t know whether this propensity for words to have opposing meanings is a special characteristic of the English language, but it feels that way to me. I never noticed it in my native Arabic or while learning French. But in English it was enough to stop me in my tracks at times. SANCTION and CONTINUE are clear examples. But also this happens because of the propensity to adorn words with various add-ons that modify or even flip the meaning around. Huda, that’s interesting. I remember when I first read Debussy piano scores, and he would notate passages “Un peu en dehors” I first thought that meant “a little out or it,” i.e. barely audibly soft. But my teacher had to explain that it meant just the opposite–“standing out from the surrounding texture– i.e. a little more forceful. I’ve always been fascinated by contronyms, as well as those words which have the same meaning once a contradictory-type prefix has been attached (what is the word for those?). English is such a rich language. Thanks for a fun NYT! Yeah, I’m not a librarian and thought that was incorrect. Thanks for confirming. I really enjoyed the AVX today. 53a and 90a led the way on the word play for me. I don’t recall seeing the Birmingham BLACK BARONs in a grid before. There were things I didn’t know but I was able to get via crossings and a little thinking – 5a and 98a. And viking as a verb. I gave it 4.5 stars. On reflection, it should’ve been higher. Wow, that AVX was a toughie. I didn’t know a lot of the references*, so the changes in a few of the team names were hard. I don’t get the title. I’m unable to see a consistent shift, but it could be because I am a little tired and perhaps undercaffeinated today. I’m hoping for enlightenment. If there was something more than one letter changed in each word, it eluded me. All teams were NFL franchises rather than being a mixture of pro sports franchisss, but that also didn’t seem significant. LAT: Gareth, I’m sorry you’re ill and wish you a quick recovery. As for the theme, I thought TRAILBLAZERS was a bit of an outlier, as it was the only one that didn’t idiomatically reference an actual article of clothing. 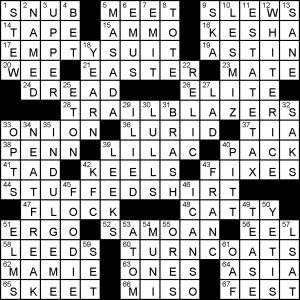 However, I thought there were a good number of wonderful long downs: NEAT FREAK, INDULGE ME, ESTATE TAX, WHITE RICE (not in our house); evocative words like LURID and CATTY; and it seemed as though there wasn’t too much crosswordese. All in all, a good offering today. Ben, change the constructor name in your title. Sorry to hear you’re sick, Gareth. Hope it’s nothing too serious. Get some rest and feel better! 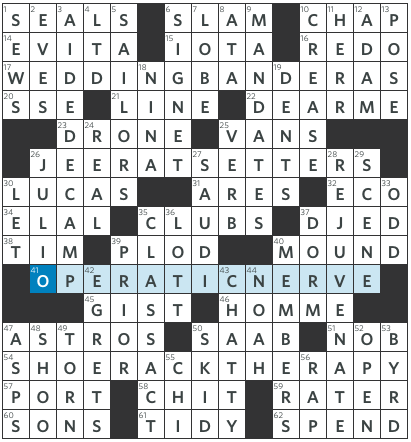 In the WSJ puzzle’s theme entries, familiar phrases TAKE (have inserted into them) SOME TIME (=”era”); at least this interpretation of “take some time” would work in a cryptic-crossword clue. Yes, the extra ERA in the final theme entry is distracting; it would be nice to have a final theme entry with two extra ERA insertions, but that must be asking too much. Re: AVX – Count me as another one who doesn’t get why certain letters are shifted, especially when all the teams have two letters shifted except Green Bay Packers, which had three shifts. On the plus side, I learned that low DEFCON numbers signify high alert levels. Each word has one letter changed, and GREEN BAY PACKERS has three words and three letter changes. Yeah, I always think Defcon 5 is the worst because I’m misremembering WarGames. Google brought me clips from that movie in which the level is raised from 4 to 3, and then from 2 to 1. No idea what the AV gimmick was meant to be. That’s not fun! The “Shift Before the Play” title … I’m not seeing any logic behind the specific letter changes, other than “these changes create a new phrase that you can clue and that might be amusing.” I asked my kid if “shift before the play” is a football term, and indeed it is. Maybe the title just means “think about football, and shift some letters by varying distances in the alphabet”? As a Bears season ticket holder, from now on the team to our north shall henceforth be known in our household as the GREEK BOY HACKERS. Plus I feel the CHICANO BEERS might be the equivalent of the Chicago Cubes baseball meme.